ABACUS Call for Proposals 2019-20 – online application available January 25. See application guidelines here. While high-school graduation rates have risen steadily across Hamilton over the last 10 years, those rates vary widely between the city’s neighbourhoods and sub-populations. Research shows that skills shortages now and in the future will require prospective employees to have post-secondary credentials to be competitive. That’s why Hamilton Community Foundation has launched ABACUS: Advancing Post-secondary Access as a route to prosperity for individuals and our city. 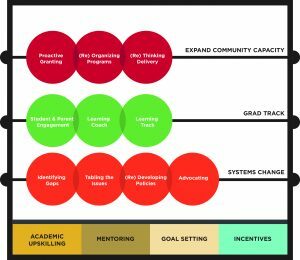 ABACUS, a collaborative initiative of Hamilton Community Foundation and The Fairmount Foundation, is a catalyst for educational transformation. By focusing on improving the academic, community and environmental factors that most directly affect students’ likelihood of continuing their education, and starting the intervention in middle school, Hamilton students facing multiple barriers will increasingly access post-secondary education. After more than a decade of convening a city-wide collaborative effort to reduce poverty in Hamilton, we recognize that increasing access to post-secondary education is the next logical step to improving our city’s prosperity. Research conducted by Hamilton Community Foundation for the past three years has informed this direction; we have identified the key barriers to post-secondary education, the populations who would most benefit from programming, the common elements of successful programs and the critical intervention points to ensure all efforts generate the most impact. To improve high school graduation rates and access to post-secondary education, including trades and apprenticeship opportunities, by focusing our efforts on Grades 6, 7, 8 and supporting the transition into high school. Part of what makes ABACUS unique is a focus on early intervention that gets students and their parents thinking about life after high school – during their middle school years. These pivotal years are characterized by significant developmental changes, yet are among the least supported in terms of focused community programs and other education strategies. Academic upskilling. Academic achievement includes those programs/initiatives that support youth to obtain the necessary grades, skills, and self-confidence to succeed in middle school and move forward in their high school and post-secondary education. Examples include afterschool homework or academic programs, computer literacy, aspirational and experiential learning, tutoring programs. Mentoring. There are a variety of forms of support and counseling including adult mentoring, access to community role models, peer mentoring, peer group activities and parental engagement. Examples include afterschool recreation programs; programs using the arts as a tool for learning; social skills programs; parental engagement strategies; and one on one mentoring programs. Goal setting. Students who are making certain decisions about their future are helped by easy access to information about their choices and the corresponding requirements. This pillar includes parental education initiatives, financial literacy, information workshops for parents and youth, support in mapping choices related to high school courses and long-term career goals, and eventually applying for student financial assistance and post-secondary education. Examples include programs that raise aspirations for youth to attend post-secondary education such as academic summer programming, time spent on college/university campuses and career planning. Incentives. Financial components are often an important incentive to students to participate in a program that can lead to post-secondary enrollment. Examples include subsidies and incentives provided through supports such as bus tickets, meal programs, or program materials, as well as incentives which reward behavior, marks, etc. Expansion of community programs through proactive granting, encouraging the reorganization of initiatives and rethinking of delivery methods. Grad Track, an ABACUS pilot project to deliver more intense programming to a small group of students. It encourages student success through an educational coach, parental supports and incentives for program completion. 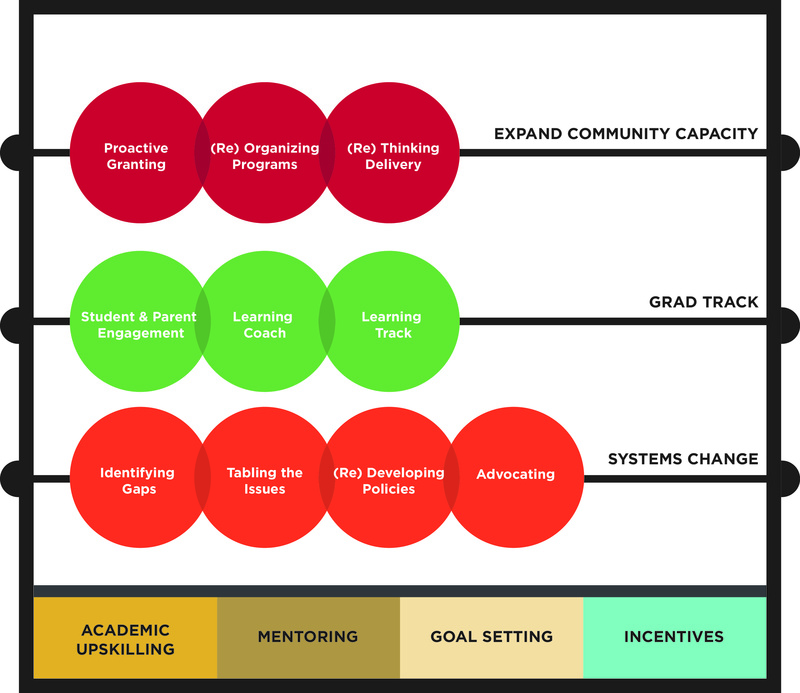 Support for systems change through convening Hamilton’s education stakeholders to examine and address issues, re-develop policies, and advocate improving systems gaps to advance educational outcomes for students. Hamilton Community Foundation has a history of bringing the right stakeholders to the table, generating collaborative solutions to complex and seemingly intractable problems. Our community supports the Foundation’s commitment to advancing post-secondary access in Hamilton, knowing that each student’s success is instrumental in improving our city’s prosperity.